Microsoft’s 3-day Build developer conference got underway yesterday in San Francisco and the first day had some interesting developments, such as the news that Windows will compete aggressively with Android on small devices, by making it free for devices with screens less than 9 inches. Also – they announced new Software Development Kits to allow easy porting of Android and iOS apps to Windows devices. 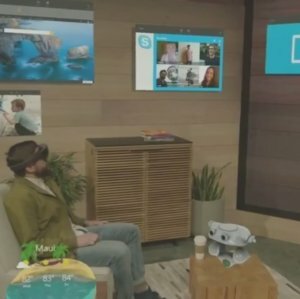 But one of the most interesting demos was of Hololens – the new ‘holographic’ or Augmented Reality interface that looks set to make computing break free from 2D screens. Originally announced in January, yesterday’s demo was the first chance to see it in action.